Taxi Girl Pinay, Rants About Disrespectful Taxi Driver, But Get Bashed As Netizens Says She is Abusive! 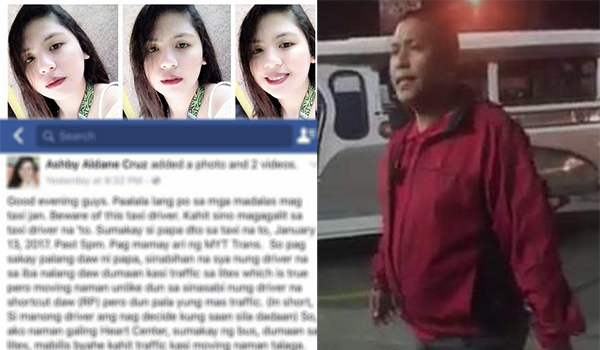 In hopes of getting people's sympathy, Netizen Ashby Aldane Cruz, or "taxi girl" went on a rant against a taxi driver. However, she did not anticipate the backlash she would get after posting. In the Netizen's lengthy post, she accused her taxi driver of being disrespectful after asking how long she detours to mercury drug would take. The driver also asked for an additional P40. However, the Netizen and her father took it badly as she saw it as an insult. She ranted about having rights as a passenger/customer. "MAY RIGHT SI PAPA KUNG ANONG GUSTO NIYA GAWIN KASI PASAHERO SI PAPA AT NAGBABAYAD NG TAMA," she wrote. She even claimed at the end of her post that she could have the man behind bars if she chose to sue him.